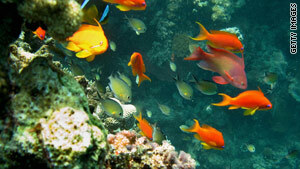 (CNN) -- Coral reefs around the world are worth a staggering $172 billion dollars a year to the global economy. But the wealth of the oceans' reefs, and their amazing monetary value, is on the verge of being destroyed. Previous estimates had suggested reefs might be worth $30 billion based on their draw for tourists, the shelter they provide fish and the protection they offer coastal communities from storm surges. But new research released last month shows this to be a huge underestimate, suggesting a single hectare could be worth anything from $130,000 to $1.2 million a year. Ecological economist Pavan Sukhdev, the head of the Cambridge University-based group The Economics of Ecosystems and Biodiversity (TEEB) presented the startling new figures at the Diversitas conference in South Africa. But it isn't just coral reefs he believes we need to urgently revalue. The research also showed that halving the rate of deforestation worldwide would have an estimated net value of $3.7 trillion for the global economy, and allow the continued absorbtion of 4.8 gigatonnes of carbon per year. However, this natural capital is under direct threat, and the combined pressures of climate change, ocean acidification, urbanization, pollution and logging are pushing the natural world to the brink. "These ecosystems are on the point of collapse," said Sukhdev at the conference in South Africa. "Unless we can get the right deal at the [UN Climate Talks in December] in Copenhagen, things look very bleak. "We need to recognize the true value of these resources as sources of clean water, as warehouses of biodiversity, as locations where over a billion people earn their livelihoods. "They are irreplaceable. We should not only be recognizing them as high-capital assets, we should be paying someone to look after them. "We are at risk of seriously damaging the global economy if we do not." Apart from a moral obligation to look after our environment, Sukdev believes that even in simple cost benefit terms conservation is good sense and investing $45 billion could secure "nature-based services" worth $4.5 trillion to $5.2 trillion annually. Sukhdev is a senior banker at Deutsche Bank, currently on secondment, and the research reflects his understanding of global money markets. The returns he outlines are extremely impressive: "investing" in coral reefs carries a return of seven percent, while rivers offer 27 per cent, tropical forests 50 percent, mangroves 40 percent, and grasslands a huge 79 percent return. He cites a specific example of this in Vietnam, where planting mangroves along the coast cost $1.1 million but saved $7.3 million annually in dyke maintenance. The idea of attaching a cash value to environmental issues has gained popularity in recent years, particularly after the influential 2006 Stern Review that showed although the costs of adapting to a low carbon economy were huge, they were far less than the costs of dealing with climate change. Sukhdev hopes his research can have a similar impact. "What is essential is that we get this off discussions and into action because these losses of natural capital are accelerating," he says. If you start throwing more money into 'biodiversity offsetting' it's like throwing petrol on a fire. "The problem is getting much more urgent. The losses in some areas are quite phenomenal. In Kenya forest cover is down to about two per cent of original levels and that's a fairly typical pattern. This loss has in turn resulted in a loss of things like fresh water. This is a time for action." Sukhdev is calling on world leaders to agree to limit atmospheric carbon dioxide to 350 parts per million. Although this is much more ambitious than the 450 parts per million currently on the table, failure to do so would, he says, be "a death sentence on the world's coral reefs." He also hopes that politicians agree to the proposals to cut deforestation put forward by REDD-Plus, a system of carbon offsetting that uses funding from developed nations to protect native forests in developing nations. But many environmentalists see problems with ascribing a cash value to natural resources -- especially when linked to offsetting projects. "It can be quite dangerous," says Friends of the Earth Owen Espley. "Once you put a value on resources they become something that you can exchange. This can lead to 'biodiversity offsetting'. For example when a mining company that destroys an area of rainforest, buys another area of forest to offset the damage -- they sometimes even claim a net biodiversity gain. "Also, the rush to include forests in carbon offsetting has led to an increase in the 'value' of forest and encouraged a land grab in which indigenous people are pushed out of their homes. "Highly forested nations frequently have weak governments and forest communities and indigenous people with weakly enforced rights. "If you start throwing more money into that context it's like throwing petrol on a fire as local elites see the opportunity for a profit." While Friends of the Earth believe it is critical to include forest conservation as a part of any deal in Copenhagen, linking it to carbon offsets is counterproductive. "We need to cut emissions and preserve forests," says Espley. "With offsetting there is the danger that by linking emissions with stopping deforestation companies will swap one for the other -- it will be business as usual on emissions as long as they buy some forest." But Sukhdev is confident that with proper monitoring the system can work. "We clearly have to set boundaries, controls and provide monitoring an recording," he says. "We are not just talking about giving money away to Governments." At the heart of his confidence is first hand experience. The banker has a personal offsetting project on land he owns in North Queensland, Australia, and says he has seen first had the benefits of restoring forest growth on local wildlife. "I have always been a banker by day and an environmentalist by night," he says. "This goes beyond economics and beyond science. I've done it myself -- and that's where I get my vision."